Kate Middleton reportedly enjoyed a second birthday bash outside of London. Kate Middleton recently celebrated her 37th birthday on January 9 at her home in Kensington Palace. She had a fun time with husband Prince William and their three children - Prince George, Prince Louis, and Princess Charlotte. As it turns out, there are several perks to being a royal and one of them happens to be the fact that one birthday party does not appear to be enough. The Duchess of Cambridge reportedly celebrated a second birthday party outside of London. The royal correspondents Emily Andrews and Omid Scobie who host royal celebrity podcast On Heir revealed Kate celebrated earlier than usual this year. Besides her celebration at the Kensington Palace home on the day of her actual birthday, Kate who was rumored to be pregnant with her fourth child reportedly hosted a private party last Sunday in Norfolk, England. The place happens to be Kate and Prince William's country home. Prince Louis' godmother Laura Meade, as well as Prince George's godmother Emilia Jardine Patterson (Kate's friend from university), made appearances at the casual evening. Earlier on January 6, both Meade and Patterson attended church service with Prince William and Kate Middleton. 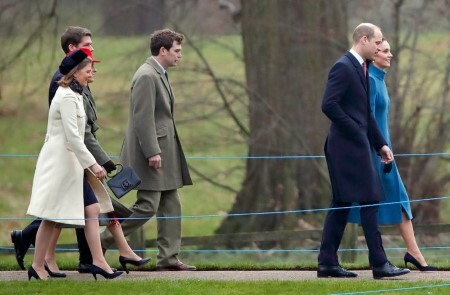 Lady Laura Meade, Emilia Jardine Patterson, Prince William and Kate Middleton attending church service at Sandringham Estate. Despite hectic schedules, it's beautiful to see Prince William and Kate Middleton still making time for old friends (turned godparents) as well as three children. Happy Birthday once again to the Duchess of Cambridge Kate Middleton!